Note; You can rent this house for the 2019 summer season for $1650 per week plus fees! This is a weekly rental ONLY Saturday to Saturday. June15th to Sept 21st. Please book between these dates Saturday to Saturday. Use of pool and access to fire pit is an extra charge per week. This beautiful restored 1876 home with OPTIONAL brand new in-ground fiberglass, salt water pool and custom built gas fire pit lounge area, sits high on the hill in town, on a private road, two blocks from the ocean with water views. The home has stained glass windows, a working fireplace, 5 lovely bedrooms, 3 bathrooms, (master bath has "jetted"claw-foot tub), newly renovated kitchen with granite counter tops, formal dinning room, giant family room with big screen tv, state of the art sound system, pool table, and super fast wireless internet. Please note that there is a separated, privately accessed second floor rental apartment that may be available for an additional charge. The apartment has views of Grand Manan Island, the quaint back yard gardens of Lubec and Canada's famous Campobello Island. View the bridge to Campobello Island while star gazing the night sky while in your own two person hot tub. If you want access to the pool and fire pit area, let me know prior to your arrival. The pool is saltwater, fiberglass pool installed new in October 2017 and heated to 80+ degrees! The gas fire pit has granite top, was custom built, and promises to keep you warm even on cool maine nights. Comfy couches and chairs surround the fire encouraging conversation, perfect for a family reunion. Lubec is a Fodor "Hidden Gem"! So get away from the rat race, get back to what matters..., Bring the family and frends. See what Downeast Maine can be like with all the amenities! I'm a TV producer and I own a small channel on Nantucket Island Massachusetts. I enjoy traveling the world learning, about new people and culture and sharing it. Lubec was what Nantucket was like in the 70s and 80s. I love the place! You will too. Honestly its one of the best houses in one the best places in the USA! This is an amazing property! This is the perfect place to spend a week with your family. My 8 year old and my nieces and nephews loved the pool, which is absolutely amazing. The grown ups had lots of space to visit. Perfect! What Geno has built here is truly special and we will absolutely be back! Owner double-booked our stay. If not for the kind people that were displaced to 2 or 3 other locations for the rest of their stay, my family of 9 from TX, including 80 yr old parents, would have been struggling to find other accommodations to suit our needs. To make matters worse, the owner completely mishandled the situation. He was rude and at first treated me like it had to be my fault even though I had booked months in advance and was fully paid just as he required over our phone conversation. I had to drive 20 minutes inland to be able to talk to him and he acted so angry that my cell service wouldn't reach from the property. He even had a friend come over that proceeded to tell me that I would have to "face reality" and "get over it" because "Geno certainly wasn't going to fix the problem from Nantucket". Really? As for the property, this is definitely an absentee-owner house. The pictures are true but what you don't see are things like the filthy upholstery in the den. Stained and obviously not cleaned in quite some time. The whole house needs a deep clean that no housekeeper could possibly get done between renters. There are 5 bedrooms but what he doesn't detail is that 2 of them are on a third floor with 2 stairs so steep that I, a 5'3" female, even had to turn my foot sideways to fit on the stair. Definitely not up to any modern code and very awkward and dangerous for most. The 5th bedroom is attached to the 4th and has only a tiny window to circulate air. He provides one tiny fan. No dressers of any sort, but there are closets in most rooms although my room had no rod in the closet so I scrounged the house for hangers and hung them on the bedrail. No overhead lighting in the bedrooms except perhaps the master? Usually one small lamp by each bed. Toilet paper? One-half roll in each bath so you will need to make an immediate trip to the store. Propane tank for grill was empty. There is the huge tv he speaks of but with 4 remotes and vague, sloppily written directions only 1 of us was able to get things running. Vegetable gardens? Overgrown, un-kept perennial bed behind the garage. At least I guess that was it? Never found another that could possible pass for a garden. I could elaborate further on how this played out, but my advise is to skip this property. I heard this was not the first time the owner had done this, but I have no proof of that. Why risk it? Lubec is a beautiful town full of beautiful people and places to stay. Move on. An Ohio Families trip to Lubec. We enjoyed our vacation very much. The house was perfect for our family. We had plenty of space and there was enough entertainment for everyone. The only thing we did not have were dressers. We enjoy unpacking during our vacations and there were no dressers in any of the rooms. However, everything else was perfect. Thanks for a great week. Extremely comfortable home in Lubec. Well maintained and appointed. Close to everything we love about the area. Everything promised by the owner was delivered. Thanks for hosting us for a relaxing week! The description of this house is spot on. 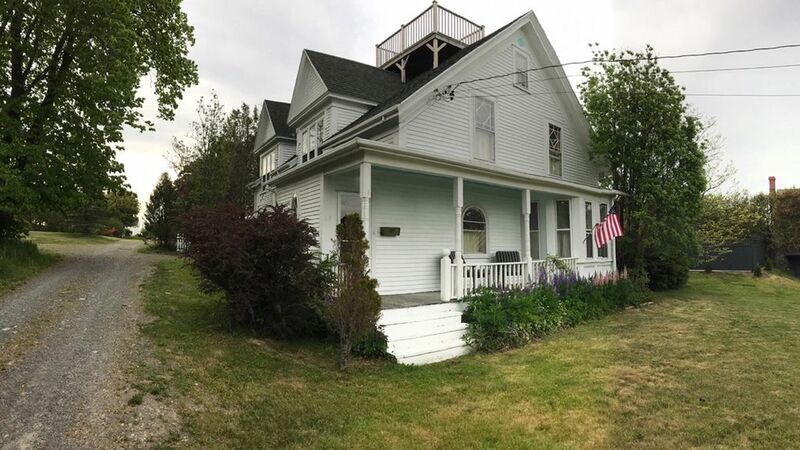 Well kept victorian within walking distance to the town center, to the IGA, a church, the restaurants and water. The kitchen was perfect for this family, all we had to provide was the food and cook it. The family room with pool table was great, especially on our one rainy day. Want to read, you can sit in the beautifully living room. The master bedroom was so large with its spa-like bathroom, with a jetted tub. All the bedrooms were a great size for all of us. The yard in the front is spacious. We had the babies out there enjoying the weather. It's a one minute drive to the bridge and border to go to Campobello Island in Canada. Having a washer and dryer was fantastic because we could bring less clothing and then go home with clean clothes. The pictures of the house are what the house truly looks like. Take a chance it's worth it! We stayed at this home when traveling to the area on an off season trip. We have stayed in various rentals before, but this one was the best so far. We cook our own meals, and the full kitchen with island was a real plus for us. We spent considerable time in the family room (although the French doors were closed since it rained almost the entire week), and we found it comfortable and relaxing. The master bedroom on the second floor was spacious and the master bath was exceptional. This house has been remodeled to open up rooms and makes good use of the space. We really wanted to go up to the widow's walk, but again the rain stopped us. If we're back in the area in the future, we will definitely look to stay here again. Lubec is the eastern most community in the United States, a coastal town with 97 miles of shore front. In 2011, Lubec will celebrate its 200th birthday. Lubec was settled in 1785 as part of the City of Eastport. In 1811, it was incorporated as the Town of Lubec. Just across the Roosevelt Campobello International Bridge is the island of Campobello, New Brunswick, Canada. The home has views of this magnificent island.